The Pennsylvania DOT – TAMP [DRAFT] is available here. 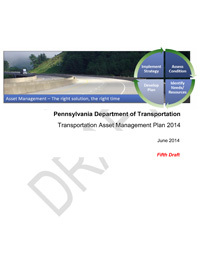 The final Pennsylvania DOT TAMP formally defines PennDOT’s framework for asset management. It describes PennDOT's risk-based, data-driven approach to project selection and its collaboration with regional planning partners. The TAMP projects needed levels of future investment to meet asset condition targets and contrasts them with expected funding levels. The TAMP facilitates a conversation regarding funding for a sustainable transportation system. This document includes the following sections: Asset Valuation, Current Methods and Tools, Data Management, Financial Plan, Introduction, Inventory and Condition, Investment Strategies, Lifecycle Management, Objectives and Measures, Performance Assessment, Process Improvements, Risk Management.